The mass murder which took place in an Orlando gay club has, rightly, shocked the world. While on Sky News a visibly upset Owen Jones was harangued into silence by two people who sought to downplay the fact that this was clearly a targeted attack on the LGBT community, vast numbers have mourned it for what it was: a homophobic terrorist attack. As is commonplace when atrocities such as these take place, our civic institutions find ways to show that they care and stand in solidarity with the victims. 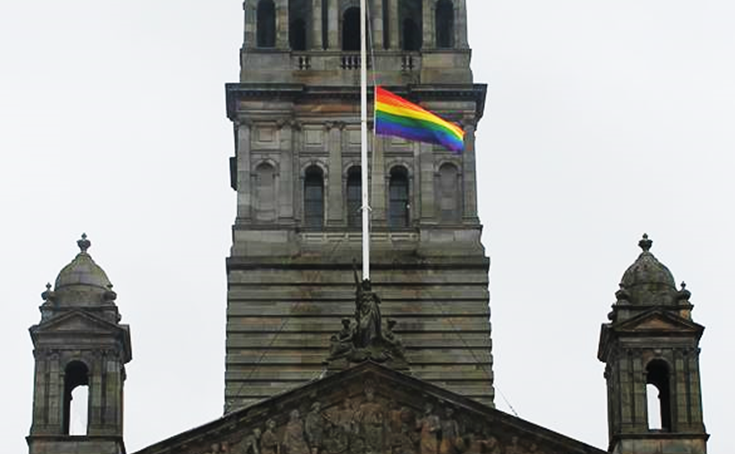 Glasgow City Council is no exception and they have flown the rainbow flag at half mast from atop the City Chambers. In many ways this is a fine and appropriate gesture. But while grief fills the hearts of many across the world today it is perhaps important to also retain some cynicism. Glasgow City Council has a complicated relationship with the rainbow flag. In 2013, the organisers of Pride Glasgow asked the council to not fly the flag over Pride weekend – as is tradition – because they had refused to cough up any cash for the event. Unusually where GCC are involved, exactly who the goodies and baddies were wasn’t completely clear in this case (as covered by A Thousand Flowers at the time). It’s probably fair to say that if they can spare some cash for the Orange Lodge they can probably afford a few quid for Pride. But on the other hand, Pride Glasgow is a fiercely corporate entity, with the sticky mits of Stefan King all over it, and for them to claim ownership of that flag is questionable at best. But what was a more interesting situation was the one that arose back in May 2014. 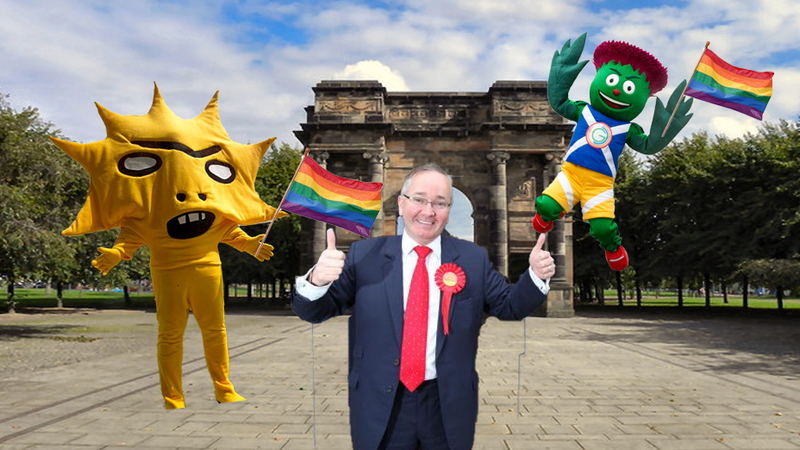 Green councillor Martin Bartos, seconded by Martin Docherty (now an SNP MP), proposed a motion to a full council meeting which stated that the rainbow flag should fly above the City Chambers in the run up to the Commonwealth Games. This was to be a gesture of solidarity to the many athletes and spectators coming from countries where LGBT rights are non-existent. During the debate, councillors from the Labour administration queued up to point out that symbolism was useless and that this was a daft idea. They pointed out that Pride House – an LGBT hub that opened during the Games – was a cornerstone of the inclusivity plans for Glasgow 2014, which was much more important than any silly flags. That’s a fair point, but it also ignores the fact that any LGBT athletes or spectators from countries where their sexuality is criminal were unlikely to avail themselves of the services offered there, for fear of reprisals were they discovered. Those backing the motion consistently pressed the point that this was a simple gesture of solidarity that might mean something to some people. Underneath all the Labour councillors’ bluster about symbolism being wasted energy, it was impossible to escape the sense that they were worried that this might cause a fuss. They really didn’t want to cause a fuss. It was going to be a big party and everyone was going to behave and the naughty opposition were to stop trying to ruin their special day. Sensing that the tide both in the chamber and outwith was against them, a compromise was reached. The flag would fly above the chambers “as close to the Games as protocol would allow”. What this ultimately meant was that the flag went up for about five minutes ages before the Games started. Crucially the council never released a press statement regarding this action. A press release for a council resolution such as this one would be standard practice. The media offered it some coverage when the motion was initially passed, but by the time the flag went up everyone had forgotten and GCC certainly weren’t about to remind them. It was the textbook definition of a cop-out, contrived and executed to avoid embarrassing our guests. When councillors tried to raise these issues later in the year, the Labour majority shut down the meeting early so they could go and campaign for a No vote on Buchanan Street (as we reported at the time). Now the rainbow flag flies over the City Chambers and the party line on symbolic gestures has changed radically. I’m not saying that the council are wrong to fly the flag at half mast. Far from it. I firmly believe that symbolic acts can bring comfort and hope, however small, to people in their darkest moments. Even if they fail in that regard it costs nothing to offer the gesture, so why not at least try. Or at least it usually costs nothing. In 2014 it may well have cost the Games organisers a great deal and so the gesture was offered in the manner of a whisper so quiet barely anyone could hear it. It’s incredibly easy to show solidarity with a group of people when almost everyone around you expects you to do it. Much harder when it may come at a material cost to yourself.